Its basic job is to separate the inside of cells from the outside. 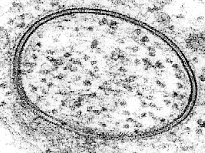 In all cells, the cell membrane separates the cytoplasm inside the cell from its surroundings. In animal cells, that is all there is. Bacteria, fungi and plants have cell walls as well, which support the cell and block the passage of large molecules. Other proteins and lipids can be added to the cell membrane. By these changes, the cell can adjust what it brings in or puts out. Some proteins are always stuck into it, these are called integral membrane proteins. It also has some which are only sometimes stuck onto it. These are called peripheral membrane proteins. The cell membrane is active and regulates (adjusts) what comes in and what goes out of the cell. The movement of substances across the membrane can be either passive, occurring without the input of cellular energy, or active, requiring energy. 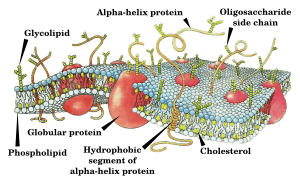 Cell membrane Facts for Kids. Kiddle Encyclopedia.